Long gone are the days of the simple tranquil honeymoon trips. These days, couples look for exotic locations that offer a wide variety of things to do and see always to include the lazy beach option. Befittingly, Grand Cayman offers more than the average getaway without the incurring transatlantic costs. Nestled in the Caribbean, the three Islands, Grand Cayman, Cayman Brac and Little Cayman make up a romantic treasure for any honeymooner. Each island has its own unique characteristics, and so whynot hop on a private luxurious catamaran charter in the Caymans and start your exploration. The largest island, Grand Cayman is not only a bustling cosmopolitan community but also has one of the longest stretches of beaches voted most beautiful beaches in the world. Cayman Brac features a very laid-back feeling and beautiful scenery. It serves as the perfect “in-between” of the three islands. And finally, Little Cayman may be called little, but is big on “wow.” It’s the perfect place to surrender to all your romantic aspirations and feed your thrill-seeking adventures. This little island is famous for world-class diving. And after lying around for a day or two, you might want a little adventure. These islands offer an array of traditional activities such as golf, horseback riding and bike riding, to the more adventurous fare like stingray swimming, kite surfing, or even an aerial helicopter tour. When the sun goes down in the Caymans, you can even book a dinner cruise for an extra special evening under the stars with your sweetheart. And if dancing is your thing, then your catamaran charter can make the arrangement of most additional requests. But regardless of what you choose to fill your day with, the food is definitely something special on the islands. World-class cuisine is the fare for the day, and the only problem you’ll have is selecting what to eat first. The "Brightest" Rays in the Caribbean!! – A visit to Stingray City will be the highlight of your vacation and an experience that will live with you forever. Together, with your beloved, enjoy this unique experience of interacting and feeding a Stingray, and then snorkeling amongst magnificent coral reefs and colorful tropical fish. After feeding, snorkeling and taking some pictures with your new friends enjoy a refreshing rum or fruit punch and truly take in the sights of our Caribbean paradise. Enjoy a Scuba Dive in Little Cayman – Devilishly deep drop-offs, wicked wreck dives and some of the coolest coral in the Caribbean have made the Cayman Islands a world-class dive destination since scuba divers started scuba diving. Bloody Bay Wall East and West in Little Cayman is the best place to look for large orange elephant ear sponges, black corals and wire corals along the sheer drop-off. Three Fathom Wall or Mixing Bowl is another destination to swim along the rails and past the bow guns of this once proud warship. 7-Mile Beach Tour via Aerial Helicopter Ride – Don't have much time but want to see some of the islands? Then this is the perfect tour for you! Prepare for beautiful views as you take off from George Town helipad. Experience the Caribbean paradise of Seven Mile Beach as you fly over miles of white sandy beaches and crystal clear blue waters of every shade from turquoise to the deepest blue. Discover the story behind “The Black and White Fingers” of the sea. So get the camera out and snap away for those holiday pictures that will put your family and friends in awe!! Dine Under the Stars on a Romantic Dinner Cruise – With their swaying palm trees, white sand beaches, and turquoise waters, the Cayman Islands offer an ideal setting for a tropical getaway. A dinner cruise is absolutely spectacular and is one of the most romantic activities to do in Caymans. As the sun slowly dips below the horizon, enjoy your meals and the beautiful views as day turns to night and the blanket of stars appear in the velvet sky. Once the ship sets sail, the real fun and enjoyment begin as you will be served a deliciously prepared three- or four-course dinner at a candlelit dining table. Finally, for those couples contemplating the idea of the best honeymoon, a catamaran charter in the Caymans could be the perfect option. 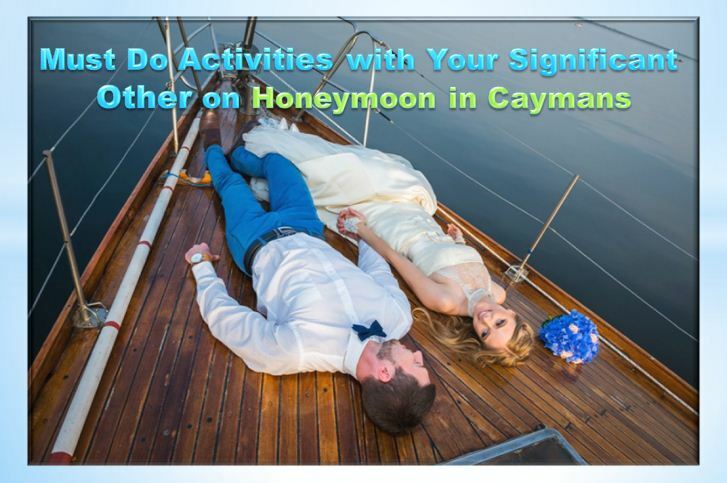 So while making those travel plans as a way to celebrate the beginning of a beautiful life together, remember that not so far away lies the beautiful pristine island chain of the Grand Caymans. Romantic, breathtaking, affordable…who could ask for anything more?